Maybe I'm missing something here, but it sure seems like the 16 million (roughly) Mac computers they sell in a year could keep them afloat as a company even if iOS was gone tomorrow. Obviously it would be a huge blow, but I don't think you would shut down a company selling billions per year in computers, would you? You may well be right. I think that Chrome OS always has been "Plan B". 1) Is there enough usable capability (without a cloud connection)? 2) Even when the cloud is available -- how does it perform compared to native apps that are close(r) to the hardware? 3) How successful will Google be pushing Chrome OS as an alternative to Android -- seeing how they will have screwed over and pissed off their partners and competitors, alike? 4) Does anybody trust Google -- even [especially] with the things that they do well? I use Google services as little as I can -- and look for acceptable alternatives wherever I can. The patents are a smokescreen, and Googlerola's Android "partners" should be very, very afraid. Motorola was hard up for cash, and Google needed patents. But there was no reason to buy the entire company - I'm sure Motorola would have been happy to sell those patents for a cool billion or two. Google is buying Motorola because they want to get into the hardware business, and Motorola is the only hardware maker they could afford that comes complete with a tasty patent portfolio topping. The patents will prove handy - it'll at least keep MS, HP and Apple from freezing them out of the handset business - but there's no way for them to make the current Android licensing model work long-term given the IP backlash Android is likely to face from Oracle, MS, Apple and others. Android will end up costing hardware manufacturers more than Windows Phone (or WebOS, if HP decides to enter the licensing game, which they might). No way will Samsung and LG pay more to Google than they would to MS or HP. The only way forward for Google is to make their own hardware, allowing them to gobble up all of the margins and thereby covering the cost of all the IP they, um, borrowed from others for Android. They'll probably still sell the phones at a slight loss just to gobble up more eyeballs for their advertising / Orwellian tracking network, but they'll make it up (and then some) via banner ads and selling your personal information to the highest bidder. The patents are a smokescreen, and Googlerola's Android "partners" should be very, very afraid. Motorola was hard up for cash, and Google needed patents. But there was no reason to buy the entire company - I'm sure Motorola would have been happy to sell those patents for a cool billion or two.. Incorrect - Moto had significant cash from the demerger. 3BN in cash according to Yahoo. Google has a long history of screwing the industries it partners with, this move will give it's Android partners some grave concerns. Funny how they all said almost the exact same thing in response to the acquisition. Just read an interesting observation at ars technica. This acquisition means that Motorola is the ONLY handset maker that now has official legal indemnity for using android. I wonder if the other OEMs will pressure google and insist on this considering their current legal woes. Maybe. That would be premised on Google being ok with everyone of their partners leaving for MS or their own platforms. (According to J-Rag, that is exactly what is going to happen). Google seems to prefer getting on lots of devices from lots of vendors. Maybe they've decided that doesn't work for them anymore, I guess. intrnet sites are saying that the foundation linux patents for android have expired. When HP acquired Compaq -- both stocks went down. It is hard to tell with AAPL, as they rarely buy other publicly traded companies. ... although, after they went public, and at the height of their popularity AAPL management (AIR including Jobs) joked that they were going to buy Xerox and IBM. +++ QFT -- You broke that code! For the short term... sure, Apple would survive (plus they have 75 billion $ in the bank)... but long term I'm sure we can all see where the future is going. Of course, I'm talking about a worse case scenario. As a tech enthusiast, I'm STOKED! I have a love hate relationship with the hometown phone maker, but I gotta say that it is a very good development for Chicago as we really need more tech firms in the area. Sure we have groupon, but chicago really does not pull its weight in technology, at least not as much as in the financial sector. We'll see what will come out of this. yeah, a lot of layoffs short term in Chicago is what I see incoming. Except Google may have bought Motorola strictly for IP reasons and let Motorola die on the vine causing thousands to lose their jobs. Conceivably, but is the IP really worth that much? Even after subtracting Moto's cash position that would value the IP at 9Billion - so it seems that Google must place some value on the enterprise too - because otherwise it surely would have been cheaper to just bid 5 billion for Nortel. If Google really wants to be in the mobile device business, this could be a very astute move. They could continue to support Android... possibly even making a deal with Oracle. But, Google has had enough time that they could have an Android alternative under development that did not use Java. They likely will have used 'Nix and copied the OS structure wherever they [quasi] legally could (Apple, MS, RIMM, HPQ). Let's call this os GoOS. Google could trade MMI GoOS for the MMI Patents. Conceivably, the Google-owned MMI company could have the proprietary hardware and a proprietary GoOS ready to go, say, late this year or early next. ...then, in a few years, fold the MMI company into the mothership. Google could have 2 OS horses in the race. Exactly that. A lot of mays and mights at this juncture. It looks like no one saw this coming, so the responses have been all other the landscape. It's going to take awhile to sort out and allow the "big picture" to be seen. It could be even be years before the wisdom or failures of the deal are clear. 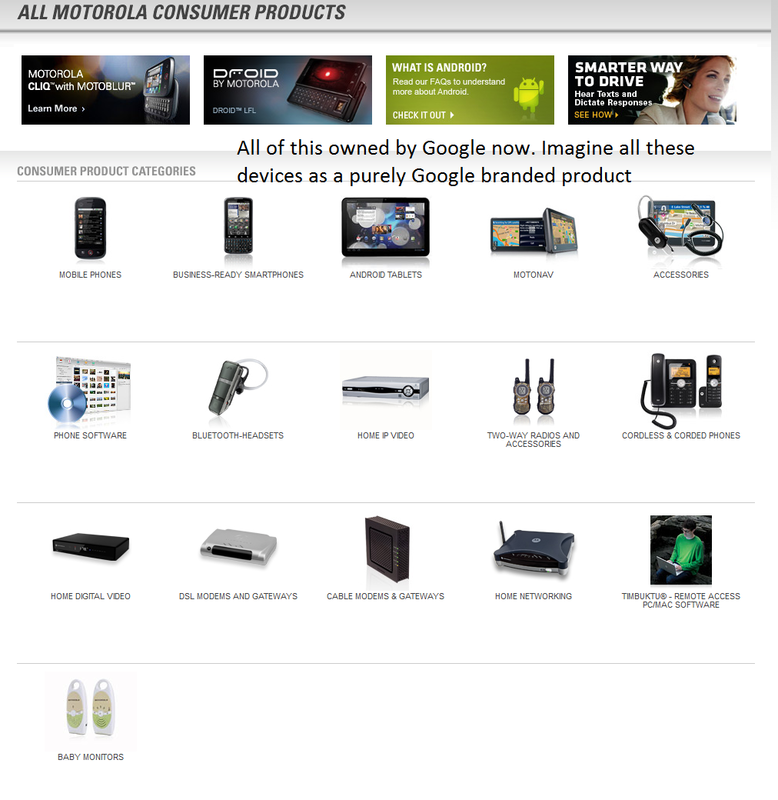 Is it just me, or does it seem like Google/Motorola have been scheming for a merger for years. First, Motorola creates its own subdivision, Motorola Mobility back in Dec 2010. Google + Motorola = purely American companies. The marriage is complete, thanks to Sanjay and Larry Page, possibly Eric Schmidt too. Totally! Now Google doesn't need Logitech anymore. Logitech shares down a bunch I bet.